Many voters around the world succumb to the populist-authoritarian temptation. At the same time, novels about dystopian societies like “1984” by George Orwell, which portray a totalitarian police state, top best seller lists. 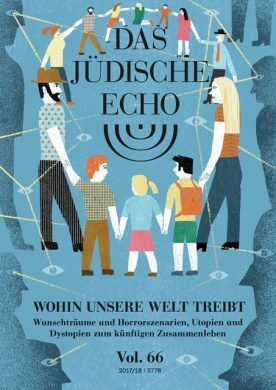 In the Jüdisches Echo 2017/18, competent authors analyze whether the constitutional state, which is liberal and tolerant of minorities, can still be saved. However, they also illustrate the constant radiance of positive visions from Herzl to Gandhi, from the European Peace Project to ecological utopias.